Illustrations of the solar system often depict the routes of planets as concentric circles around the sun. Now, imagine each of the planets is a note, and every time it passes a stationary pick, that note is "plucked." The constant rotations would create a unique melody. Luke Twyman, an illustrator and graphic designer from England, created a virtual music box that does exactly that. He originally designed SolarBeat five year ago but just re-released his musical representation of the planetary orbits with an updated interface, graphics, and sound controls. Each planet is assigned an arbitrary note. As their orbit takes them past designated points, their note sounds. 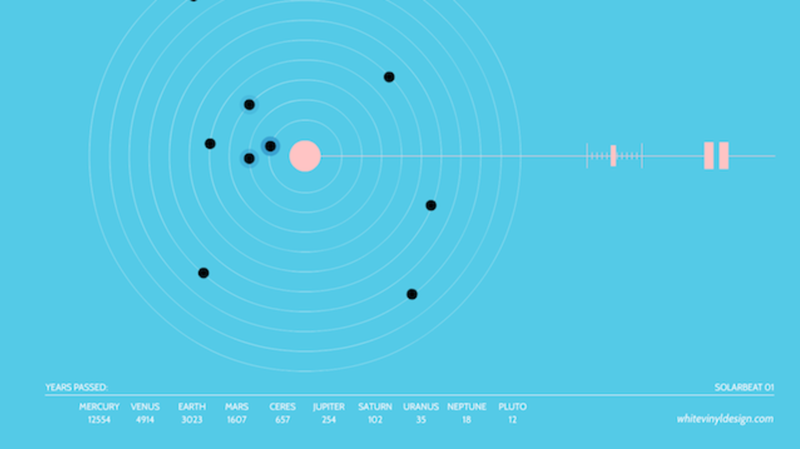 The varying orbital distances of the nine planets (here Pluto makes the cut), "ends up generating this unending, interesting pattern," Twyman told Wired. You can slow down or speed up the whole thing but the relative relationship between the orbits, and the notes, stays the same. The perfectly circular orbits that never overlap aren't scientifically accurate, but the soothing repetition beautifully simplifies the constant motion of the solar system. And it sounds great, too. "It really lends itself to generating ambient music," Twyman says. Check it out at the SolarBeat link above.